Drizzy was having none of it. 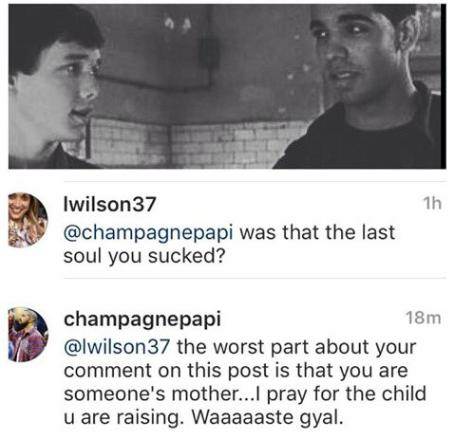 Drake handed out a savage comeback for someone who tried to diss him on Instagram. The ‘Views’ rapper, who is currently mourning the death of his one of his friends Star Trek actor Anton Yelchin, hit back at someone who tried to make light of the situation. Drizzy initially dedicated an Instagram post to the late actor, alongside the caption: "Rest In Peace Anton". The Instagram user was then bombarded with a stream of abuse by Drake fans. Anton Yelchin tragically died on Sunday 19th June after being crushed by his own car. Meanwhile, Drake is currently preparing to drop new music alongside French Montana. Drake and French Montana were recently spotted shooting a music video for a single rumoured to be called ‘No Shopping’ in the Dominican Republic.